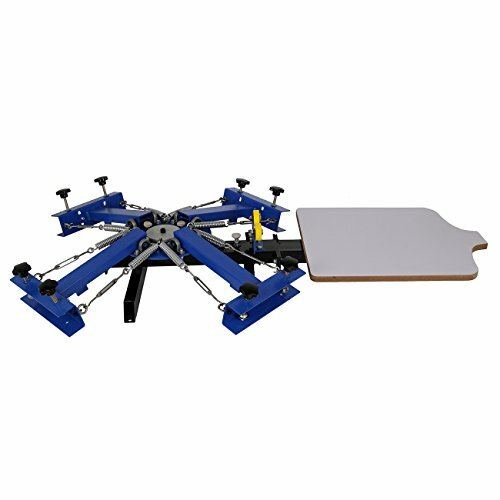 1.This machine is specially designed for T-shirt screen printing because of its dedicated T-shirt pallet which can guarantee the accurate positioning and good printing effect. 2.This silk screen printing machine can print onto clothing (especially for T-shirt), woven fabric, metal, paper, copybook, plastic, circuit board, wood, glass, ceramic tile, leather and other plane printing substrates, which is especially suitable for small businesses and individual printing shop. 3.It can also be applied to printing on substrates which need overprinting, such as pillowcase, bag, non-woven bags and so on. - The machine has all-metal construction,advanced electrostatic spraying and electroplating, durable,easy to clear and no rust. - Adopt combination design, save place, more convenient for transportation. - Detachable shirt boards, user can only change the pallet according to the substrates to satisfy the needs of different kinds of printing. - All equipments are perfectly packaged, all metal parts are separate packaged, which guarantees products safety during transportation, especially suitable for exportation. - It can install four screen plates which is available for four color overprint and design proof of screen printing business. The machine has all-metal construction,advanced electrostatic spraying and electroplating,durable,easy to clear and no rust. Screen printing platens can be rotary independently, easy operation, higher efficiency. Super support device make the machine stable and balance. The device of adjusting double spring tension make the machine available for screen frames of different weight. also the machine is equipped with full set of installation tools, for installation and operation. This 4 Color 1 Station screen printing machine can be applied to costume, woven fabric, metal, paper, copybook, plastic, wood, glass, ceramic, leather and other products which need flat printing.